NEWS REPORT: Draw against Belarus in EHF EURO 2018 qualification prompts Dujshebaev’s decision. Late on Sunday night, Talant Dujshebaev announced that he will step back and resign from his position as Poland national team coach after his team drew with Belarus some hours before. “Yes, this is true,” Dujshebaev confirmed to ehf-euro.com. After four rounds of EHF EURO 2018 qualification Poland still wait for their first victory and are last in the ranking. The ticket to the final tournament Croatia is more than endangered, as Poland are five points behind Serbia and four below Belarus (and lost direct encounters with both). “I am responsible for those results, so I have to take the responsibility,” Dujshebaev was quoted in several Polish media. The former World Handball Player of the Year has been at the helm of the Polish team since the Olympic Qualification Tournament in spring 2016. After securing the place at Rio 2016, he steered his side to the Olympic Semi-final, but lost the penultimate match against Denmark and then the bronze-medal match against Germany. But the most recent international tournament, the World Championship 2017 in France, did not have a happy end for Dujshebaev, as Poland missed qualification for the eighth-finals and finished 17th as the winners of the President’s Cup. Up until the end of the EHF EURO 2016, Dujshebaev was Hungary national team coach parallel to his job with VELUX EHF Champions League 2015/16 winners Kielce, where he has worked since 2014. 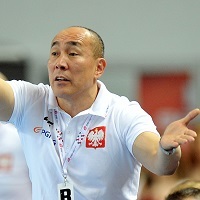 Dujshebaev succeeded German-born coach Michael Biegler, who resigned from the position after Poland missed the semi-final of the EHF EURO 2016 on home ground.